(Bloomberg) -- The Packer dynasty has sat astride corporate Australia for a century, forging newspaper, television and casino dominions with the power to make and break governments. The end of that reign was once unthinkable. It’s now a possibility, though, after James Packer’s casino operator Crown Resorts Ltd. said this week it was discussing a A$9.99 billion ($7.16 billion) sale to Las Vegas-based Wynn Resorts Ltd. While the talks collapsed just hours later, the billionaire has sent out a clear signal: he is willing to sell his firm’s approximately 46 percent share in Crown and dismantle a family empire built up over four generations. Wynn’s unlikely to stay away and other suitors could join the fray, Deutsche Bank AG said. A sellout by Packer would be the culmination of a multi-year overseas retreat, a tumultuous period marked by a crackdown in China, an ugly split with his fiancée Mariah Carey and a public battle with his mental health that forced him to quit Crown’s board in March 2018. A spokesman for Packer’s personal investment company, which holds his Crown stake, didn’t return a call and an email seeking comment. A Crown spokesman declined to comment. Along with Rupert Murdoch and his family, who still control much of Australia’s media assets, the Packers have rarely escaped public scrutiny. James Packer and Lachlan Murdoch, Rupert’s eldest son, were also co-investors in One.Tel, the Australian phone company that collapsed in 2001. Four years later, James had to shoulder the biggest inheritance in Australian history following the death of his father, Kerry -- a bear-sized polo player with a temper and gambling habit to match his dominant stature. Packer Sr. also harbored a disdain for politicians who stood in the way of making money. Still in Kerry’s shadow, James set out to transform his late father’s media empire into an international business equipped for the digital era. He amassed a collection of casino and entertainment assets that reached beyond Australia into North America and Macau. That sprawl included stakes in the award-winning Japanese restaurant Nobu and movie-production company Ratpac. Packer’s highest-profile new venture was in Macau with Lawrence Ho, son of casino kingpin Stanley Ho. There, the young billionaires opened their first casino in 2007, aiming to lure mainland China’s biggest bettors. That was to mark the beginning of the end of Packer’s global ambitions. The key turning point came in October 2016, when Chinese authorities rounded up Crown’s staff on the mainland, before a court convicted 19 current and former employees of illegally promoting gambling. According to Kitney’s biography, based on extensive interviews with Packer, the arrests hit the billionaire hard. Packer was staying at the time in a house on the Los Angeles estate of Hollywood legend and close friend Warren Beatty. Packer recalled in the book that he was drinking as much as a bottle of vodka every day, and Beatty drove him to a psychiatrist for medication. The episode “shook me to the core,” Packer said in a rare interview with an Australian newspaper in October 2017. Packer also said he wanted a more “simple life” and acknowledged he’d lost friends, put on weight and had led a reclusive life at his polo estate in Argentina. Within a year of the detentions in China, Crown had closed almost all its regional marketing offices in Asia, which funneled big-stakes players to Australia, and sold out of the Macau casino venture. The company also ditched an undeveloped plot in Las Vegas where Packer had once hoped to build a casino. Crown stepped back to focus on its Australian casino resorts and the construction of another in Sydney. Investors are betting the Melbourne-based company is now in play. Crown stock has this week clung on to the bulk of the gains triggered by Wynn’s bid. The shares closed at A$13 on Friday, clocking a gain of 11 percent this week as Crown emerged as a takeover target. Read about Wynn’s regulatory troubles, which may affect Crown talks. Wynn’s A$14.75-a-share proposal would have shrunk Packer’s controlling share in Crown to a far smaller stake in the U.S. gaming giant, which owns resorts in Las Vegas and Macau and is one of many companies with designs on a casino license in Japan. 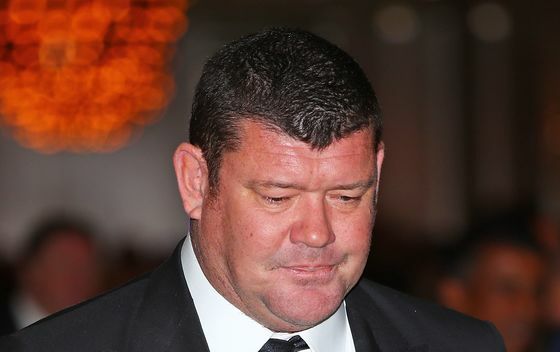 Handing control of Crown to Wynn could have given Packer a ringside seat overseas. It’s what Packer had tried and failed to do on his own.